I have been doing some electrical work in my house and I noticed it has old knob and tube wiring that is still hot, should this be replaced as found or is it fine to just leave it? It seems really old and brittle, so I'm a little concerned. The advice my family once got from an electrician on this question was that if you have low amperage service and NEVER touch it, you're probably okay. If you have regular electrical service or touch the circuits at all, remove ALL of it. His basic theory was that if you keep the wires cool, and they haven't caused you trouble yet, it's unlikely to cause a problem. Granted that advice was about 15 years ago and none of that wiring is improving with age. Once you touch the lines at all, rip it all out. It's very likely that you will introduce a problem between the coating and the wire. The house we were dealing with went another 10 years before we needed to rewire one of the old circuits. Once that happened we rewired the entire house all at once. If you're concerned at all, turn off the affected circuits, and get rid of it. Better safe than sorry on this one. Generally, it is a good idea to replace it, especially if you can easily access it. One thing you don't want to do, is replace part of a circuit. Then the next guy might see the new romex and make some assumptions about the rest of the wiring. The other time you really really should replace it is if it runs through insulation, especially blown-in cellulose. That is a serious fire hazard. Knob and tube was designed to use open space as an insulator. Myths abound about K&T, and lots of it is ripped out unnecessarily. The K&T wire is exactly as thick as modern wire, and was installed by skilled craftsmen using bulletproof soldered joints rather than plastic wire nuts. The ceramic tubes will outlast civilizations. With certain important exceptions your K&T will outlast the house itself, unlike modern wire. K&T is more heat resistant than the equivalent modern wire, because the conductors are separated by an air gap. The ceramic tubes mean that even if the insulation deteriorates it creates no fire hazard. And in fact, if you check fire statistics you'll find K&T wiring is as, or more, safe than modern wiring. Hammered nails or screws can create subtle shorts and sparks in modern wire, but have little to no effect even if they pierce K&T wires. 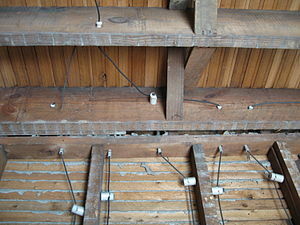 Poor installation is more common on modern wire, compared to K&T which was installed only by guild trained electricians. Legislation was enacted in Washington state to allow insulating over knob-and-tube wiring per Bonneville Power Administration (BPA) specifications. This resulted because there were no documented cases of a fire being caused by knob-and-tube wiring, whether insulation covered it or not. Leaving light fixtures on K&T is especially practical, as grounding matters much less, and these are typically the hardest runs to replace. That said, much K&T wiring is either overloaded by modern uses, or has been hacked to death by bad renovation. Our jurisdiction (Berkeley, CA) requires an inspection by a licensed electrician prior to insulating over Knob & Tube (see here). Fuses have been replaced with appropriate circuit breakers (15 amp for 14 gauge wire). MANY problems with K&T were caused not by the K&T, but by the fuse box -- it used to be possible to put any size fuse into any position. No branch circuit is overloaded (selectively add circuits to bring things in balance. Rewire your kitchen. Run separate new circuits for the dishwasher and laundry and any place within 6 feet of water). 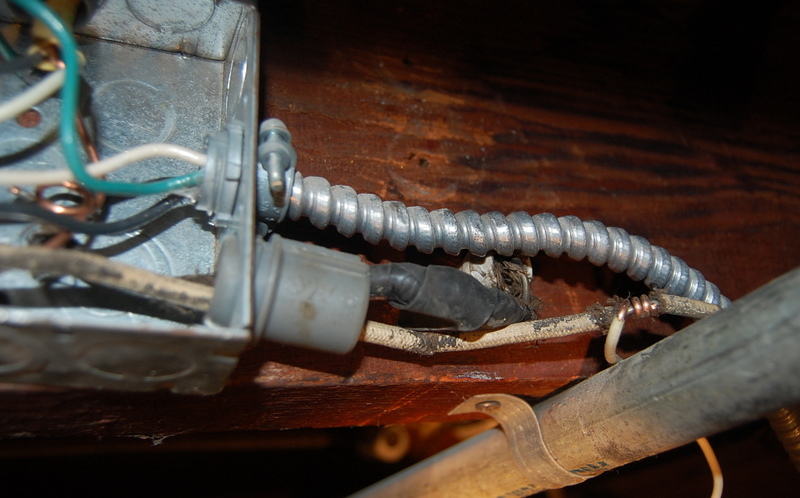 Check insulating loom where K&T enters metal junction boxes is still in acceptable shape. This is weak point on K&T installs. Slip new shrink wrap insulation over the old. Check no wire can sag, and touch a plumbing pipe. Consider an AFCI breaker for K&T circuits. Use great care when changing a light fixture or outlet on K&T. The loom where the wire enters metal boxes is a weak point, and is easily damaged. The danger with K&T is that somebody messed with it. Here's a picture of a pretty typical example. Someone jacked a new circuit in. They cut the old knob & tube short, destroyed the original insulation, did a hack tape job, then installed a modern metallic cable almost touching that mess. This particular instance created a big spark some years later as the grounded metal cable hit the now bare wire. Original K&T installers never let the wires touch except protected by ceramic tubes. There may be issues with your insurance company. I recently bought a house and asked two insurance companies about the knob-and-tube wiring. Liberty Mutual said that they would insure the house, but would require that the knob-and-tube wiring be removed within 30 days by an electrician. Met Life said that they would not be able to insure the house until the knob-and-tube wiring had been removed. Insurance was no problem: No company cared (I ended up getting it from Travelers, via GEICO). So, I wouldn't let the insurance stories scare you until you pick up the phone and ask. What they do care about is the type of Circuit Breakers you have. The modern ones that look like switches, or the old wire ones (that burn). That may be an issue if you have the old plugs. Theoretical fire hazard: you see, they need to be able to "breathe". That is why they say that it is a problem to insulate over K&T. And why everyone will say, that if "you touch it" you may disturb it and hence you should remove it. They have no grounding. So that "3rd" leg some appliances may have even if your socket accepts it, will do nothing. That is a higher risk of getting an electric shock. my personal conclusion, if it is not broken, don't fix it. do it only if you are doing some other thing which justifies the work. Expect anything from $3000 to $10,000. A big problem with K&T is the horizontal runs - sagging over time means stress on the insulation, which becomes brittle from oxidation (not the wire - the rubber insulation), and can break off. You then have (a) bare wire(s). Should those wires come in contact with horizontal piping - particularly after something like a renovation, which usually redistributes loads and causes fresh settling - you have a recipe for a short and a fire. This exact thing happened to a balloon framed Victorian (vint. 1898) in RI, causing a fire on the third floor. Fortunately, the smoke was spotted by a passerby who came in, woke the occupants, and saved their lives. The water damage was extensive, and the cost to restore with matching full dimension lumber, lath/horsehair/grey coat and finish plaster was very high. A beautiful Italianate Victorian was nearly lost to history but for the passerby. All K&T was replaced, and worth doing. Yes definitely. In some spots, knob and tube is a deal breaker for a house sale and must be replaced before the house is sold. It's fairly dangerous to have around, even more so if it's brittle. I'd hire an electrician if you're not comfortable replacing it all yourself. Yes K&T is ancient wiring and in some locations it is pretty safe. I have even seen some of it on MASH 4077 where wires are run in pairs and held by cleats. As mentioned elsewhere, there are NO grounds and it could be possible since there is no color code like "black for HOT or UNGROUNDED CONDUCTORS" "WHITE FOR GROUNDED" to put in a new circuit and share a neutral and this could be "VERY BAD" as the neutral could be overloaded and start a fire. If the Neutral is 12ga wire (which is good for a 20 amp circuit) that is fine, BUT if you share said neutral with another circuit because the neutral for the new circuit got broke or is not accessible than the 1st neutral could be carrying a lot more current. The fuse for the new circuit will not "blow" if its ampacity is not reached but it will if the return is through a 'loaded neutral from another circuit. The best way to tell is to get a rubber lightbulb socket with 20 or 30 foot ends with crocodile ends. Put one end on water pipe or known ground and touch the other end to the wires; if the lamp lights, the wire is a "HOT" wire, then the wire running along side by a few inches would most likely be a ground but you could take lamp test wire and put to a "known "hot wire and using other lamp wire touch to ground then spray paint the wire with the ground connection white. K&T wire was the only wiring method used in the 1st part of the 20th century. Houses had lights and radios. Maybe a house had a toaster. After many years of heat build up and over use, any wire will degrade and its ampacity will diminish. Today, we ask an 80 year old wire to run things that require more then the century old wire can deliver. Would you ask an 80 year old car to take you to Florida from Ohio while pulling a trailer? Of course you wouldn't That is exactly what we are asking an old electrical system to do. Nothing lasts forever. It is a safety issue and so in my opinion, after 30 years in the electrical business this is what I would suggest. Replace that old overused outdated wire before you spend money on the pretty kitchen. Not the answer you're looking for? Browse other questions tagged electrical fire-hazard knob-and-tube or ask your own question. What is “knob and tube wiring”? How can I attach modern fixture to knob & tube wiring? Can I replace an outlet that uses knob and tube wiring with a grounded outlet? Is it unsafe if some three prong outlets don't properly test as grounded? Should I use a GFCI or AFCI circuit breaker with knob and tube wiring? Can disconnected knob-and-tube wiring be left in place? Is it “normal” for a vacuum cleaner to trigger an arc fault breaker? Is it safe to put insulation next to knob & tube wiring? Japanese Appliance has a Green/Yellow Ground Wire coming out of it, What should I do? Are the old A-head terminals for connecting to knob and tube wiring still compliant? In knob and tube wiring, how to identify neutral wire vs a dead wire?